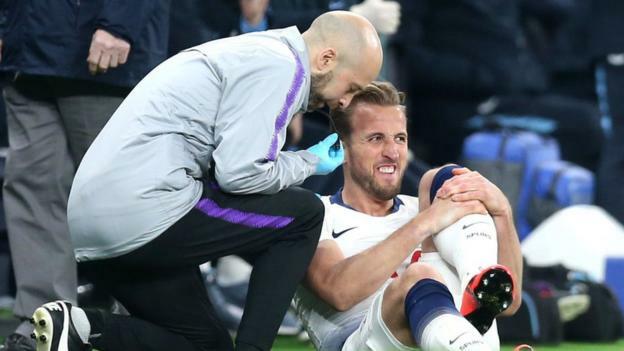 Kane, 25, will have an MRI scan on Wednesday after hobbling off during Tuesday’s 1-0 win over Manchester City in the first leg of their Champions League quarter-final. Former Tottenham midfielder Jermaine Jenas said on BT Sport he would “be surprised if Kane plays again this season”. Ex-Chelsea striker Chris Sutton described Kane as Spurs’ “king” and said it is a “massive blow” for the side, who are chasing a top-four finish in the Premier League with six games to go. “It’s the way he lands on his left foot. He makes the challenge and then his ankle rocks, which would suggest ligament damage,” Sutton told BBC Radio 5 Live. Kane, the top scorer at last summer’s World Cup, could also be a doubt for England’s Nations League semi-final against the Netherlands on 6 June.